Structural analysis and design of timber structures Buildings is a structural design software for analysis of timber shear walls structures realized using both CLT (Cross Laminated Timber) and platform frame systems born at University of Trento and developed by TimberTech. 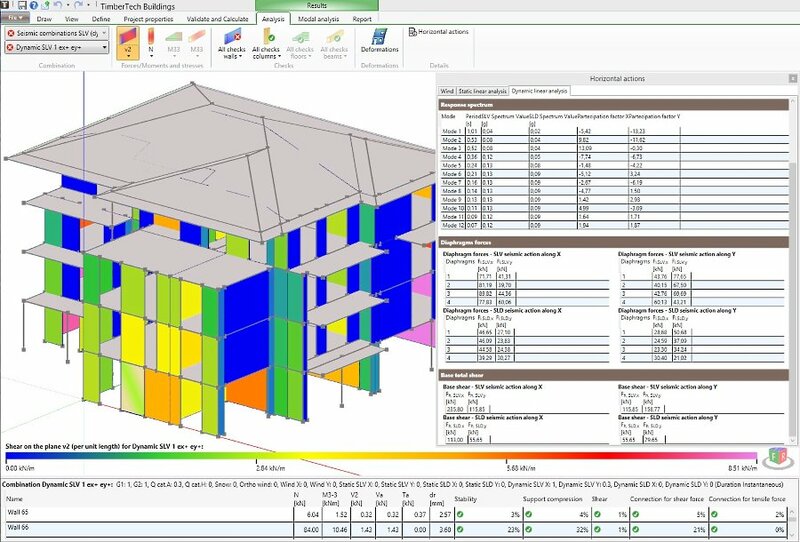 Reliable, quick to master and easy to use, constantly and automatically updated, TimberTech Buildings is developed to meet all the needs of the designers, from import DXF to high-speed modeling and export of calculation reports in Word format. The 3D graphical interface allows you to quickly and efficiently define the structural model. The 3D Viewer allows the extruded view of the structural members for more control over modeling and BIM technology ensures greater efficiency and productivity. The physical-mechanical and geometrical properties of the timber construction elements and wooden materials are preloaded in the software. For example you can finde the products of the leading manufacturers of CLT panels (Binderholz, Stora Enso, KLH, LENO, Mayr Melnhof, Rubner Holzbau, XLAM Dolomiti, Essepi, Diemme Legno, L.A. COST). There are internal databases with the characteristics of the products of the main European manufacturers (Rotho Blass, Heco, Wuerth). The user can also create new connections and customize them changing their strength and stiffness. You can choose different types of fasteners: smooth nails, threaded nails, anker nails, staples, screws and fully threaded screws. You can also choose different types of connections: single and double hold-down, punched metal platers for tesnsion forces, timber-to-concrete angle brackets, timber-to-timber angle brackets, punched metal plates for shear forces. The software guides the user in the definition of the geometrical and mechanical properties of the CLT and famed walls. The software guides the user in the definition of the geometrical and mechanical properties of the ceilings: joist floors, solid timber floors and CLT floors. The user can define in a simple and intuitive way the connections for shear and tensile forces both for ground floor or upper floors. The software guides the user in the definition of the geometrical and mechanical properties of the CLT wall vertical joints. Snow load, wind load and seismic action are automatically generated according to the site where the structure is located and the selected Standard. The user only has to select the parameters that characterize the loads using a specific wizard. Modal analysis, very useful to find the various periods at which a structure will naturally resonate. Mode shape can be displayed in a very simple way. The software automatically calculates the wall lateral stiffness also taking into account the contribution of the connections. The software performs the analysis of the whole structure subject to the non-seismic loads (vertical gravitational loads and wind) which are automatically generated for each load combination prescribed by the selected Standard. The software allows to model pitched roofs, performing the calculation and the automatic redistribution of loads acting on the beams and the joists which can have any inclination within the roof plane. The software performs the checks of the timber and of the steel beams considering the lateral buckling resistance. The user can quickly define the lateral restraints and all the parameters needed to checks the element. The software automatically generates a clear and detailed technical design calculation report which can be exported in Microsoft Word format. According to each load and load combination, the software allows to export the actions on the foundation, in csv format, both as forces at the midpoint of each wall and as distributed forces along the length of the walls. This export, together with that of the geometry of the foundation, will be useful for designing the foundation with a dedicated software. The software is able to import 3D DXF files in order to help the designer to draw the geometry of the structures. Moreover, the distribution of the columns and the shear walls with the detail of the connections can be exported in a dxf file provided with legend indicating the number and type of connections used. Finally, it is possible to export a DXF file that contains the geometrical characteristics of floors, roofs and all their components. 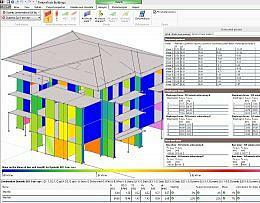 * TimberTech Buildings download link provides demo version of the software. The program for the sizing of wooden structures, for fire tests, for the calculation of metal connections, of the structural joins and of the wood-concrete collaborating floors. spFrame, formerly pcaFrame, is a feature-rich structural analysis program for two- and three-dimensional structures subject to static loads. TimberTech Buildings has been rated 4.7 out of 5 points. A total of 3 votes cast and 0 users reviewed the software.